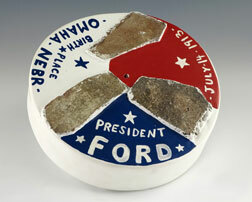 Plaster of Paris disc composed of three pieces of bricks from Gerald R. Ford's birthplace in Omaha, Nebraska. The plaster is painted red, white, and blue. Ford was born Leslie Lynch King, Jr., on July 14, 1913, in an ornate Victorian house at 3202 Woolworth Avenue.